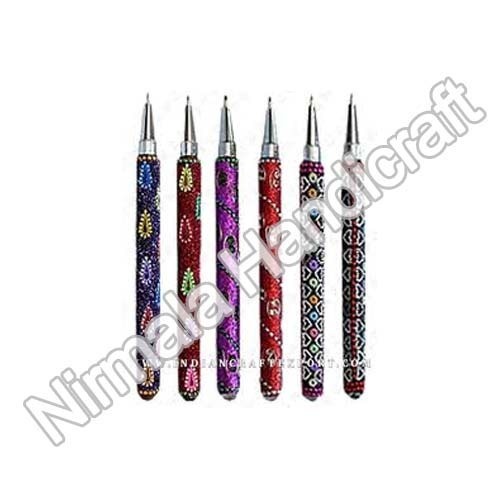 We have emerged as a foremost manufacturer, supplier and wholesaler of an alluring Designer Lakh Pens. These pens are designed and made to perfection by our knowledgeable artisans. In addition to this, clients acclaim our products for both gifting as well as decoration purposes. with an aim to get in-tune with the clients' preferred demands, we offer these pens in multitude of color schemes, designs, patterns and sizes. Since its establishment in the year 1995, Nirmala Handicrafts is a one of the trusted organizations engaged in manufacturing, supplying, wholesaling and exporting a wide assortment of Handicraft Items & also provide Painting Services. Under this range, We are offering a eye-catching assortment of Meenakari Elephant, Meena Painted Peacock, Handcrafted Ganesha Ji Statues, Handicraft Elephant, White Metal Handicrafts, Wall Hanging & Brass Stone Items. Our offered range also comprises Wooden Handicrafts, Wooden Animals, Meenakari Ganesha Idols, Musical Items, Wooden Ganesha Statues, Wooden & Brass Hukha, Copper Items and many more. Clients from both international and domestic market appreciated our offered range for its durable finish, vibrant colors, scratch resistance, appealing look and stunning shine. Apart from this, with the support of a dedicated team we are also rendering Metal Meena Painting, Brass, Services. These services are widely acknowledged in the market for their unique pattern, innovative design and excellent finish by our esteemed customers'. We export our products in Indian Subcontinent & South America. We have established a sophisticated infrastructure facility, which helps us in streamlined functioning of our business operations. Our facility is segregated into various departments such as manufacturing unit, quality testing unit, warehouse and packing unit and administrative unit, which are managed by our def team of professionals. We have equipped this facility with latest machinery & equipment and technologies to retain a larger production line. Furthermore, our facility is maintained, oiled and upgraded by us on regular interval of time to ensure smooth functioning and increased productivity. Moreover, all the consignment are checked on various quality parameters to ensure its compliance as par the international quality standards and is timely delivered. Owing to our ethical business dealings and large distribution network, client-centric approaches, our organization has gained huge appreciation in the markets.